The Continental Avenue building currently home to an HSBC Bank has gone up for sale, with an asking price of $16.5 million. The brick building, located at 107-15 Continental Ave., spans about 9,000 square feet, and features a half-timbered facade emblematic of Forest Hills’ architecture. The bank’s lease at the site is set to expire in July 2019, according to Goldenwood Property Advisors (GWP), which is arranging the sale. 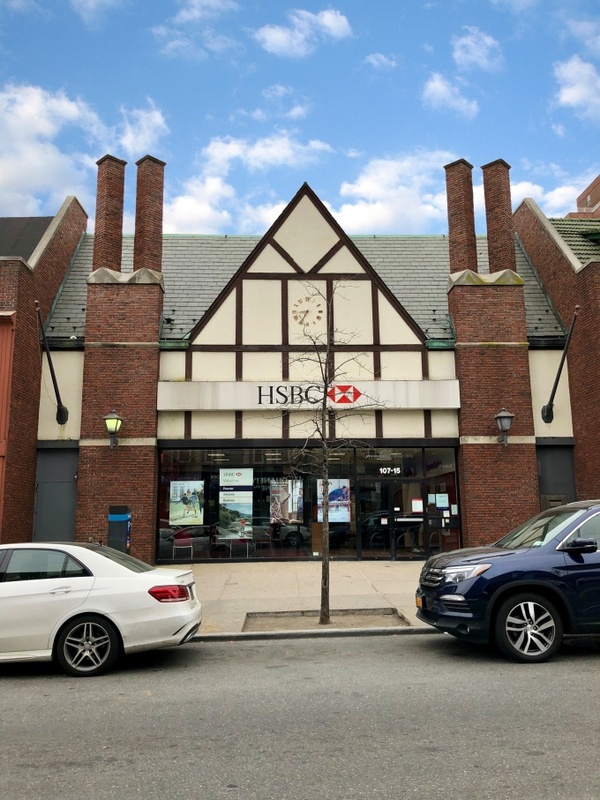 The 6,500 square foot property, which has housed a bank tenant on site since construction in 1974, is zoned to commercial use and is within the Special Forest Hills District, allowing for a 26,000 square foot development. The zoning, according to Rubin Isak, founding partner of (GWP), is flexible and allows for a wide mix of commercial uses. A buyer, for example, can build a mixed-use retail and hotel project on site. Despite the building’s historic look, it is not a landmarked building, and does not lie in a historic district, meaning future developers will be allowed to tear it down and redevelop it completely. Well HSBC is moving to a smaller location which used to house Payless Shoes in Forest Hills. It would be a shame to lose such a beautiful building, but considering that there is so much unused space in front of it, it will likely be replaced by some kind of high rise. If the new owners do that, traffic will be a nightmare on Austin/71st. Not that the city zoning agencies care – as long as wealth developers keep making more money and donating to the campaigns of deBlasio and Cuomo. Business people have a right to make a profit on their business. They have a right to sell their buildings. I don’t believe anyone in this thread would pass up $16 Million. It’s easy to call others greedy when it is not your money. Grow up. Forest Hills doesn’t need a hotel or any more residences! We need small businesses. I have lived here a long time and miss places like Homestead Deli, the Hallmark store and other stores. We need a good deli and diner, not corporate stores where the staff doesn’t know anything about its merchandise and don’t exert themselves to find out. Can somebody explain to me why the FH Community Board doesn’t stop the spread of the oversized houses being built down Jewel Avenue and surrounding areas? Isn’t there a height limit on private homes or is the CB and the Building Dept. getting paid so much money to let the USSR people do whatever they want to the neighborhood? They’ve destroyed it by tearing down the beautiful homes that were there for years! They think the KGB is watching them because I have never seen homes with so many cameras and cars in the driveways with PA and other out of state plates. I totally agree with your view! Those houses are ridiculous and have totally changed the neighborhood for the worse. I can’t believe they will get rid of this building either but I guess we all know what that’s called: greed. Who owns the building? and why are they selling it?